While it might have a bullseye on its head after the SCG Seattle Open victory, now is a good time to play Red. Several decks have been breaking through, including one that I’m going to introduce in this article, and if you’re a Red mage like me you should find something here to your liking. 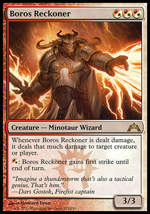 No Boros Reckoner – He’s usually just a target for removal before you can use him for value, he doesn’t apply damage to your opponent immediately, he slows down the list, and you want to be as aggressive as possible in game 1. 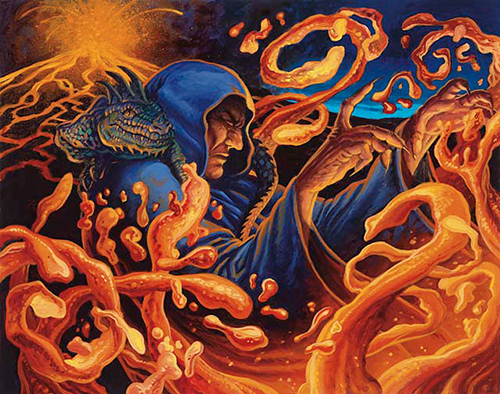 He’s debatable as a sideboard card, but ultimately choices like Chained to the Rocks, Spark Trooper, and Fated Conflagration go farther in this list because of some of the drawbacks to tapping down lands to play Reckoner in a Burn deck. This is a deck that loves to just sit back and do as much as possible during your opponent’s turn. It’s also a deck that requires critical thinking to get to the right amount of damage, and any stutterstep will make it feel like a very poor choice for a tournament. 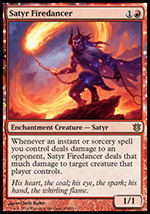 Firedancer in the Sideboard – This is a hot ticket for debate, but he’s certainly not good enough maindeck. If you play this deck enough, you’ll realize there’s plenty of matchups that you don’t want him in against. That said, against decks like Mono Blue and GR he can be an unstoppable force if left unchecked. This list punishes your mistakes very harshly, as you’re effectively playing a watered down version of Legacy Burn. If you decide to kill more creatures than you need to, or miss a few points of damage here or there, it’s almost assuredly going to cost you. I personally had trouble playing this archetype to its full value despite being able to play it mostly well, so ultimately I moved on when given the opportunity. I think it’s probably one of the best Red decks in a long while, especially in this format, but you’ll want to practice heavily against all the Tier 1 archetypes before jamming it. I would say the Mono Blue and Monsters matchups are the most skill intensive, so start there. Blind Obedience and Chandra are very good cards for the mirror, so if you expect a lot of that in Cincinnati, I’d have them in your 75. Being able to turn all of your Boros Charms into Lava Axes and having a personal howling mine is a really big deal. I also found Blind Obedience to be helpful in the BW matchup at slowing them down and effectively nullifying Obzedat (aside from the life drain). Last week I was mulling over the possibility of going to the TCG 5K in Chicago, but I was not terribly confident in the Burn list I had been playing. I knew it was good, but it wasn’t exactly the kind of Red deck I’m crazy about and I felt like some of the conclusions folks were coming to surrounding it were not necessarily true. As the week dragged on, the itch to play Magic at a competitive level grew to it’s usual high pitched whine in my head and I figured out a ride situation to get down there. Now I just had to find a deck. A few months back, Magic professional and writer Adrian Sullivan played a RW “Aggro” list that he ultimately won a 5k with. I always liked the deck, but felt that the original version was outdated and remembered that he lost to Mono Blue in the SCG Open that he top 4’d with it at. Losing to Mono Blue has been the bane of my existence for the last several months, and unless there was an updated version with a significantly different plan, I couldn’t see myself rolling with his deck. There’s a beauty to this list that just can’t be seen when you first look at it on paper. Playing it reminds me of the first time I picked up Sligh when I was a kid and curved out into Ball Lightning followed by a fist full of burn to the face. It has all the great elements of Red that you could want and it can play whatever game is demanded of it. This flexibility is the secret sauce of this deck, and I’m going to do my best to explain to you how it works and why it’s better than your other choices. You can be the aggressor. This deck frequently has hands that curve out just like your typical Mono Red Aggro deck, and in today’s Standard of scry lands and tapping out, this is a good place to be. A guy was watching one of my practice games at our local win-a-box last night and saw me go turn 1 Satyr, turn 2 Zealot, turn 3 Phoenix, turn 4 Chandra, turn 5 Strike + Charm = Death. He asked me if that was a typical hand with a surprised look on his face. Yes sir, yes it is. You get to play Tajic and Chandra! Yes, you read that correctly. Tajic, Blade of the Legion. While most of you probably thought Tajic was going to sit in your “crap” binder waiting for some little kid to pounce on it, he’s actually worth playing in this deck. He’s not a card you want a lot of, certainly not more than one of him ever, but drawing into him randomly always feels like one of the best feelings out there. It’s very easy to get his battalion activated with the playset of Mutavaults and plethora of haste creatures, and his indestructibility is invaluable against big creatures that are giving you problems or control decks that expect to take over on turn 4. There’s only a certain set of cards that remove him and he applies a clock quickly, so when he’s something that tends to come down after your opponent has gone through a litany of their options they’re very often hard up at that point. Chandra, Pyromaster shines better here than any other deck I’ve played her in. Every single one of her abilities takes you straight to valuetown with the surrounding card suite. Her +1 is great when you’re playing the deck in its “Controlling” role and gets back your Phoenixes, her 0 ability can draw you cards for days in certain matchups because you have creatures that protect her nicely, and her ultimate can kill opponents in many situations due to the presence of high impact burn. She’s also extremely effective at taking out the one blocker that gets in your way when you’re on the heavy aggro plan. Bottom line, she’s an all star in this deck and almost makes me feel like I’m playing with Koth again. You have answers at every stage of the game, followed by big threats they have a tough time answering. It’s still possible to run out of cards or just draw poorly, but for the most part this plan is very strong. It was in a sideboard slot that was up for debate between Chandra’s Outrage and Homing Lightning. There’s applications for all three, but ultimately at the 5K almost every situation I was in revealed Fated Conflagration to be better. In one game against GW Aggro, my opponent curved out into a turn 3 Ajani that immediately ticked up to 5, after which I played Conflagration on my turn to kill it and scry into much needed supplementary removal. If you need land, you can scry during your upkeep like Magma Jet. It kills Polukranos, which came up in my match against Jund Monsters and ended up swinging the tide of that game back in my favor. Against Control, it allows you to board out your Mortars for a card that is far less dead and gives you more outs to Jace and Elspeth. Overall, I couldn’t recommend it more, and the intensive mana cost was never an issue even though you might have a game somewhere over the point of time where it could be a problem. Your White cards don’t need to be played on time. The beauty of the light splash color is that the cards you’re playing don’t need to be played immediately. Boros Charm, Chained to the Rocks, Tajic, and Wear // Tear can be played just about whenever for value and usually can sit in your hand for a while if you’re color screwed. There have been a few games where not having White cost me, but not enough that it became a deck issue. It’s not like trying to jam a WR creature on turn 2, the spells aren’t detrimental to the curve. Furthermore, the benefit from having all of your lands come into play untapped except for the 4 temples is a big thing. Any of you who’ve played other RW builds know that having a Guildgate come into play tapped is usually the absolute worst in most situations. You’re always using your mana with this deck, and frequently it’s to have some combination of creatures attacking with a Mutavault while holding up mana for burn. One additional note, Adrian has mentioned that a 2/2 split of Shock and Searing Blood might be better in the board. I was aware of it before the 5K but wanted to keep the additional tempo of a playset of Shocks against Mono Blue, and ultimately I’m still comfortable with that. Blood is however incredibly strong against other decks, mainly other aggro variants or Burn decks, so it’s still worth it at times depending on what you think the field might consist of. I might ultimately come around on his opinion too, I need to test it again more to get the full sense of what I think is right. The first thing that made my eyes go wide (well, after watching him pummel folks to an 8-0 record to start out the swiss) was the 21 land count. 21 lands, 4 of which are Nykthos and 1 of which is Mutavault??? What the hell? I spoke with him about this and his logic was fairly sound. With four Magma Jet, you can often scry into the additional lands that you need beyond the two required to operate. Burning-Tree and Nykthos fuel many of the other draws, so most of the time it’s fine, with some of the time requiring a little more aggressive mulliganing. That plan is not foolproof, as I’ve seen in post-tournament testing, but it was good enough to allow him to cut through a field of talented players. He was also playing in his first major tournament, and making a decent number of mistakes along the way (no worries Kevin we all do! ), but he was still getting there. I was rooting for him big time when he went up against Josh McClaine (top 25 in the world) in the first round of the top 8 and took down game 1 with an incredible series of draws that culminated in a late game fury of double burning-tree plus Phoenix into Fanatic for 7. Maybe in the end he was simply running hot, as all good tournament runs require a little of. But the deck makes you smile a bit and the added amount of cards + removal you get to play with only 21 lands gives it some kind of strange longevity that the old Red Devotion lists didn’t have. Kevin if you read this, congratulations again on making Top 8 and I wish all the best for you in the future. I know there were some controversial moments in a few matches that people took sides on, but hopefully it’s all water under the bridge at this point and I hope that you continue to improve on your list for future big tournaments. 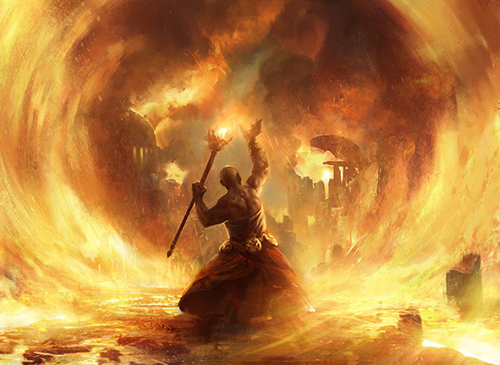 Many people find Mono Red appealing when they first start playing Magic. The cards are usually the least expensive to acquire for a deck that has a competitive edge to it, the strategy of attacking with a lot of creatures and casting direct damage is fun, and you can win quickly. Eventually though, as many of those players mature, they begin to gravitate towards other strategies and often regard Mono Red as a deck for “newbies” or something that is too simple to be truly competitive. The truth is, even in extremely hostile formats for the archetype, Mono Red has almost always broken through and succeeded. Any longtime pilot of the archetype will tell you that if you truly play this deck as intended it requires a lot of skill, patience, and careful decision making. Anyone can play the deck, but it takes effort and experience to master. What I hope to bring to my readers today is a better understanding for some of the fundamentals of playing Mono Red Aggro (Sligh, Red Deck Wins). I will also briefly discuss a new deck I’ve been working with at the end that I hope to take to some bigger tournaments. An adage old concept in Magic is knowing who the beatdown is in a game or matchup. Say both you and your opponent are playing aggressive decks. One of the common mistakes of newer players is to always be attacking with their creatures and using their reach (burn) on their opponent rather than their opponent’s creatures. It’s important to recognize early on what role you should be taking based on the cards in your hand, the cards in your deck, and your opponent’s plays / cards. If your opponent leads off with a one-drop creature into a two drop and your first play isn’t until turn two, it should be evident that you need to play more defensively and try to remove his options before proceeding with your own. Be aware of what you’re going to do post sideboard. If you and your opponent are playing nearly identical decks, you have to be able to use your sideboarding to your advantage. Bring in extra burn to deal with their creatures and play the “control role”. Typically aggro decks do not have a lot of draw power or the ability to play a successful late game, so if you can exhaust your opponents creatures with removal and then play yours unmolested, it’s important to recognize that ability. Or if you anticipate your opponent will be doing the same, sideboard in bigger creatures to make your deck become “Big Red”. This doesn’t mean you can’t be “the beatdown” and be aggressive if your opponent has a slow start, so it’s also imperative to pay attention to who can effectively “race”. Know your deck, know your outs, know your role. One of the biggest mistakes for new players when playing against a Control or Midrange deck is that they overextend. As fun as it is to cast all of the cards in your hand by turn three or four and swing in for lots of damage, it’s crucial that you are able to recognize what an archetype can do to slow you down and their ability to do that in a specific game. Most control decks over time have had some kind of mass sweeper effect on turn four. From cards like Wrath of God to Supreme Verdict, these are the lynchpins to their ability to take over a game. In today’s age, we have to fight even tougher obstacles like Sphinx’s Revelation, Elspeth, and Aetherling. Recognize which decks have critical cards like this and when your opponent is going to likely play these cards and sandbag (hold back) cards in your hand accordingly. You still need to apply an appropriate amount of pressure to win the game, so make sure you do the math as often as possible, but know when to push and when to pump the brakes. Most newer players would be surprised at how easy it is to still force your opponent into bad decisions with only one creature on the table and a manland. Or having two creatures apply constant pressure forcing a Wrath while you hold two more in your hand to follow up. Your opponent only has so much spot removal and so many Wraths, and their late game is much better than yours, so every life point counts. There’s a famous saying I’ve often heard over time, “If you’re playing Red and your opponent wins the game at 1 life, you probably did something wrong”. On this same note, it’s relevant to know what cards are in your opponent’s list if it looks similar to something from previous bigger tournaments. Are they color screwed in the first three turns meaning they won’t get to play their Wrath on time? If they are going to be able to play their Wrath on time but it will require them to take two damage from a land since it’s their only white source in the deck, does that matter to how you play out your hand? Why did your Mono Blue Devotion opponent leave one mana up, does this mean he has a Rapid Hybridization to change your combat math? Should you play your Fanatic of Mogis or Magma Jet during your mainphase because your opponent’s only out is an Azorious Charm or he’s tapped out meaning he can’t counter? He didn’t cast Sphinx’s Revelation for the full amount, does he have a counter for your Skullcrack? These are extremely critical mental processes that you should all be exercising if you’re playing Red Deck Wins. Something as little as the Magma Jet example is a play I get asked about a lot, yet is truly meaningful to the outcome of the game. Magma Jet’s scry is one of the few ways you have to gain some filtering card advantage in a match against a deck that often has much more advantage than you, so being able to have it resolve can often be the difference in a game. Most Red Aggro lists are very streamlined with a lot of four-ofs and a consistent approach plan. One of the biggest questions from less experienced players is how to sideboard and how many cards to bring in. I often see players bringing in a ton of cards and saying that 8-10 creatures in the deck are “terrible” in a given matchup. You must be able to understand what you’re doing to your maindeck when making a decision like that; once you dilute to a certain point, your deck no longer resembles the lean, mean machine that it once was. Your advantage of being able to get consistent quick kills and overrun an opponent who stumbles vanishes. That’s something that can’t be ignored, as it’s integral to how this archetype wins every game. Usually, if your Red Aggro deck is competitive, it shouldn’t need a lot to fix a few matchups or give it some extra percentage points in your favor. If there are extremely problematic cards, they probably have a weakness. Take for example Blood Baron of Vizkopa. This is a great card and something no red player likes facing against. But the card isn’t invincible. For starters, it costs five mana which is a lot and means it may not even see play in many games against you unless your opponent has a lot of early removal. Secondly, its four-toughness can be exposed. Cards like Mizzium Mortars which will often come out of your sideboard can kill it outright, but even something like the first-strike damage from a blocked Ash Zealot followed by a two-damage burn spell will take care of the problem without costing you any board presence. And getting your opponent to block with it is not that unrealistic when they’re probably on the backfoot and struggling to stay alive by turn five. Even if they are able to get in a combat step and swing with the Baron, you have a lot of direct damage in your deck and typically a big army to swing back. Be aware of what you can do in the next few turns to get out of it and what possible sequence might enable you to execute that plan. Sometimes an environment can seem overly oppressive and it just appears that certain cards are unbeatable. This is rarely the case. I want to take you back to the time of Scars-Standard, because two cards in particular made a Red player’s life hell; Kor Firewalker and Timely Reinforcements. For a while red players weren’t able to figure out how to get around this mess, and even when they were it wasn’t perfect, but there was a plan available. Famous Red mage Patrick Sullivan used cards like Shrine of Burning Rage and Dismember to get around these problems or ignore them, and other players gravitated towards Hero of Oxid Ridge to nullify the advantage and lifegain from Timely Reinforcements. For a while I used Unstable Footing to stop Kor Firewalker’s protection ability from “preventing damage” so that he could be killed in combat or by another burn spell. Skullcrack can do the same thing against cards like Master of Waves (although I don’t agree that’s a good strategy against him in that particular case). If you’re unsure of how to beat an archetype or set of cards, look through the available pool and try things out. Almost everytime, there’s an answer, it just needs to be discovered. Your sideboard should have a purpose. Even if it looks crazy with a bunch of cards that others wouldn’t play, as long as you know what they are for and how you’re going to board them in and execute your plan, that’s all that matters (and testing that plan ahead of time of course). It’s also the same reason you shouldn’t just copy a sideboard of someone’s that you saw online because they won a tournament. You need to know how it works, even if they provided a guide of what cards to sub in and out. There’s no definite rule of how to board for a given matchup, paying attention to what your opponent is doing should always determine which cards to sub in and out. You should make sure that your sideboard appreciates and respects the current metagame. For any given week, there are a series of decks that are considered top tier and are expected to be played in heavy numbers at an event. Paying attention to tournament results can help predict and prepare, along with testing, but you also need to make sure that your sideboard addresses both these and the unknown. It’s key to balance the numbers with respect to that too. Don’t include three sideboard slots against a deck you might only face once at a tournament. Conversely, don’t have eight cards for an overly difficult matchup. Cover your bases. I remember one State Championship in particular where I was playing Jund and had thoroughly practiced against all the available archetypes except for Boros Aggro because I didn’t have time and ultimately just decided I was probably fine against it. I was going to put Jund Charm in my board which I knew would hands down swing the match from some early going testing, but ultimately decided not to. Turns out I went 5-0 to start that tournament and then lost two straight, first to the previous State Champion playing Boros Aggro, and then to another player on the same. I won the last round to finish 6-2 and 15th place, but it most likely cost me a shot at top 8 for that event. It was an oversight on my part, and it was an easy enough change to my board that I could have made. Lastly, make sure that your sideboard cards are useable in multiple matchups or that you have a variety of cards that can function similarly. Traitorous Blood was a great magic card because it provided Red with a way to answer any midrange deck trying to stick one big creature and win the game. Even if they had an army it could allow you to trample over. As such, it could be used against any deck that was of a similar standing, whether it be a Jund, Bant, or Naya opponent. On the flip side, a similar card in the current format Act of Treason is a bit more narrow because of the loss of trample and as such isn’t as good against decks that can supplement their big creatures with a lot of little guys for chump blocking. Decks like GR Monsters provide a perfect example of that, as they have Scavenging Ooze, Elvish Mystic, and Sylvan Caryatid to get in the way. A card can also just be used in your sideboard as a “5th” or “6th” of a card in your maindeck if it functions similarly. You might not put a Thunderbolt in your maindeck, but there are some matchups where the narrow ability of the card doesn’t matter and it acts as an extra Lightning Strike. The most common concept for Mono Red Aggro is to have a deck that executes a good curve. I could talk about this subject until the cows come home, but better writers than me have already done most of the work. For a detailed explanation, take a look at some of the articles in my Articles section on my site’s homepage. The layman’s version is that your deck should have a certain amount of cards at each casting cost in order to carry out its gameplan on a consistent basis and to make sure you are able to play your cards fluidly. You don’t want to be stuck with a bunch of expensive cards in hand or out of cards within a few turns. You also don’t want to see your deck have vastly different draws everytime, you should know what to expect based on the frequency of a certain card type or casting cost. Don’t start adding so many four drops to your Mono Red deck for example if the amount of lands your running can’t get you to four reliably or if it comes at the cost of early aggression. Know how your deck is going to flow, and if that’s to your liking. Your lands should do something other than add mana! This concept is often missed, and a lot of people don’t even think about what lands they’re going to run when piloting a mono-colored deck. If there are lands in your format that can activate and become creatures, cycle for extra card draw, or enable a bonus of some kind to your creatures, it’s usually the right call to have a few in your deck. Being mono-colored means you’re already limiting your pool of available cards in comparison to other decks, so the advantages you get from having a card like Mutavault cannot be overlooked. This leads me into my final rule. . .
Reach is the ability of your deck to get past a ground stall or stuck situation. When building a Red Aggro deck, you can’t just take every good creature in the format, pile them into a sixty card build, and call it a day. Your deck needs cards that can break a ground stall or enable you to get past the barriers that are available in your metagame. It’s one of the huge advantages to playing a Red Aggro deck versus other colors. If your opponent plays a huge blocker or a card that prevents you from attacking well like Propaganda, you can still get through with Burn for the last few points of damage you need. Knowing when to take your burn upstairs (to the face) or downstairs (to their creatures) is an important piece of knowledge that you need to obtain when playing this archetype. Clearing the road with your burn or preventing your opponent from doing bigger and better things (killing a mana elf for instance) is a skill that takes time but is necessary to become successful with this style of deck. Even a card like Nightbird’s Clutches can act as reach, so don’t rule out a card just because it can’t do damage to your opponent (even though most cards in your deck should). You can take pain in your endevour to win the game. Life isn’t as precious a resource to Mono Red Aggro, as you should be winning the race most of the time. It’s one of the reasons why cards like Manabarbs were so strong back in the day in Sligh, because even though you’d take some damage from it, your opponent would usually be worse off than you since your deck was dishing out the damage at a much faster rate. It could also prevent them from playing their critical cards that they need to get back in a game. It’s not always correct to play a card like that, you need to “be well ahead” but it can be a useful tool to suicide yourself a bit in an effort to prevent your opponent from doing anything meaningful. Another card that I’ve had a lot of success with (against Control) out of the sideboard (James if you’re reading this it’s the one I was talking about) is Satyr Nyx-Smith. I decided to try him out in place of Viashino Firstblade, and he’s been really impressive so far. 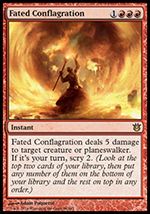 I think the deck might want some number of either Mizzium Mortars or Fated Conflagration, but otherwise it’s a strong deck and it rewards playskill more than most. Blind Obedience has helped to slightly improve the GR and BW matchups, but overall those ones are tough in general. Still, this deck has some great sequences and if you play carefully any matchup is easily winnable as the tournament results proved. If this deck gets popular, I’d recommend putting 1-2 Chandra, Pyromaster in the board as she’s a great card in the mirror. Card advantage is the name of the game there, and making sure to have Skullcrack available for their Warleader’s Helixes. Another change I’ve been testing for quite some time is having Spark Trooper maindeck to improve some of the bad matchups and to play carefully around removal, but I haven’t decided yet if that’s the direction this deck should head. There’s a lot of testing that needs to be done to iron out the last few cards, but this list is much better and much more potent than early builds that I played when the archetype first started surfacing. Mutavault and Ash Zealot are key reasons for this, and I strongly suggest you don’t cut them if you’re experimenting with different cards. As always, keep tapping those Mountains. . .